“Frankly, it is dangerous and of great concern to our Department of Health,” said a New York county official. A group focused on Jewish mothers has been spreading anti-vaccine propaganda, pushing narratives of damaged children and broken religious laws in New York neighborhoods that are now the epicenter of the worst measles outbreak in almost two decades. PEACH, formally known as Parents Educating and Advocating for Children’s Health, has been circulating magazines and pamphlets since at least 2014 that claim vaccines are in opposition with Jewish religious law, (falsely) link vaccines to autism, and recount anonymous horror stories of children being irreparably harmed by vaccines. Led by Jewish mothers, the group has brought anti-vax arguments and conspiracies into a community known for its cautious interaction with the modern, secular world. “Frankly, it is dangerous and of great concern to our Department of Health,” Rockland County spokesperson John Lyon told BuzzFeed News. Public health officials have called the measles outbreak a crisis, with 180 recorded cases of the disease since last fall in Rockland County and at least 285 in New York City. In both areas, measles has struck particularly hard in Orthodox Jewish neighborhoods, and health officials have worked with rabbis and other community leaders to spread the message: Vaccines are safe, and they save lives. The PEACH stories and "experts" tell a darker story, one that's been repeatedly debunked by mainstream science, medical professionals, and religious leaders. 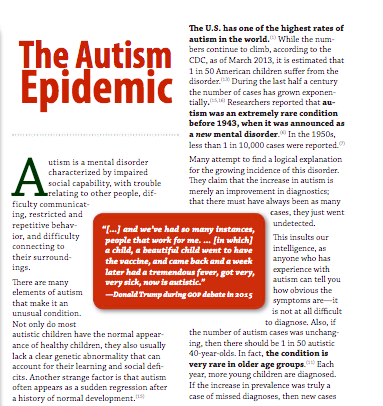 The pamphlet downplays the danger of diseases such as measles, while pointing to the increase in diagnoses of autism. (Experts say those numbers have risen as parents have become more aware of autism, and doctors now diagnose a range of characteristics as part of the autism spectrum.) The pamphlet accuses pediatricians of covering up the dangers of vaccines for financial gain — another conspiracy theory — when in reality, vaccines are a tiny sliver of the pharmaceutical industry's profits, and individual doctors can lose money on administering vaccines. Then there's the anonymous testimonials, apparently offered by other Jewish moms — terrifying stories that are difficult to verify, but apparently endorsed by a neighbor. They offer the kind of appeal that causes fake news to spread on Facebook or urban legends to travel by word of mouth. "My husband is a nursery school Rebbe. He watched a cute, outgoing 3-year-old boy change overnight into a silent boy who stopped interacting with the other children. When my husband inquired if anything had recently happened to this boy, the mother told him that he'd just received vaccines," read one testimonial. Still, thousands of residents have listened to public health officials and received vaccinations in response to the recent measles outbreak. But as new infections continue, Rockland County has taken the unprecedented step of banning unvaccinated children from public places, a decision now on hold as it faces a court challenge. On Wednesday, New York similarly declared a state of emergency, requiring any person exposed to the virus to be vaccinated. Miranda said the city is aware of PEACH's activities, and anecdotally at least, the group seems to be having an impact. To fight back against vaccine misinformation, city health officials are working with sources in Orthodox neighborhoods that people already trust, including rabbis and community health organizations. The city health department has also taken out ads in Jewish newspapers and worked to circulate fliers of its own. IRS documents show that a group named Parents Educating and Advocating for Children’s Health received tax-exempt status as a public charity in 2015. Its operations apparently remain small, under the $50,000 donation threshold where more documentation would be required. Its principal officer was listed as Rebecca Fleischmann, who told BuzzFeed News that her nonprofit group did not publish or have any association with the magazine or pamphlets. 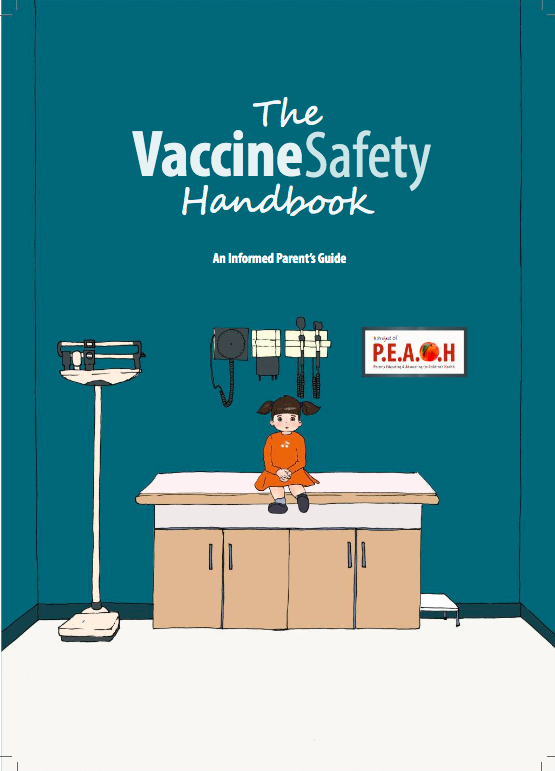 However, a .pdf of The Vaccine Handbook was hosted on enrichedparenting.org as of Monday morning. When asked about the .pdf by BuzzFeed News, Fleischmann said she would ask her web developer and reiterated her nonprofit was not involved in the creation or publication of any magazine. The .pdf was taken down, though cached versions remained. Fleischmann has publicly been an advocate for holistic health care for Jewish families, as well as a proponent of allowing exemptions from vaccine mandates. Her nonprofit Parents Educating & Advocating For Children's Health, Inc does business as Enriched Parenting, and on its site, Fleischmann describes herself as a wife, a mother of four, and a speech language pathologist who previously worked with autistic children. The site offers information on various health topics, and its pages on vaccines and autism, as well as vaccines and Jewish law, were taken down. It continues to host a New York form for parents seeking a religious exemption from vaccines. Representing the group, she in 2017 signed a letter to the Department of Health and Human Services protesting current vaccine standards and accusing federal health officials of misleading the public about vaccines and autism. "Enriched Parenting is a DBA of Parents Educating & Advocating for Children's Health, Inc. Our organization is not affiliated with Peach magazine. We are an organization that supports religious, philosophical, and medical choice. We are not, nor ever have been 'anti' anything other than coercion and loss of civil liberties," she said in a statement. "We support informed decision making and right of choice for all parents. Our activities are geared toward education and health options on a wide variety of subjects not limited to vaccine information. We are a pro-choice organization." Like in many communities in the US, vaccines prompt big discussions among observant Jewish women. On the online forum Imamother, where observant Jewish women swap recipes and parenting tips, threads about vaccines often get hundreds of replies. In 2014, one pro-vaccine woman complained about a magazine by PEACH that unexpectedly showed up on her doorstep. 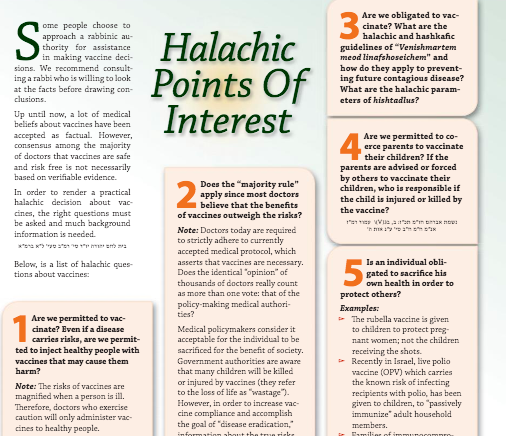 Promising “How to Prevent Your Children From Being Damaged by Vaccines,” the magazine drew ire from some women who feared the outsize influence a publication promoting its Jewish viewpoint could have in gaining Orthodox women’s trust. Over the years, other women said they received PEACH publications, which also include a 40-page pamphlet titled "The Vaccine Safety Handbook," in various New York and New Jersey communities. The new pamphlet directed women to find more information via a telephone hotline, a typical way for religious Jewish women to get information tailored to their values. The Akeres Habayis, or homemaker, hotline offers a number of channels, including music, inspirational lectures, and information on managing stress. For several years, it has also provided “The Truth About Vaccines” in a section claimed by PEACH. Recorded lectures claim to offer medical backing to debunked myths via a series of anti-vaccine experts. PEACH also has used a conference call line to connect moms with anti-vax rabbis and other guest speakers, where they can ask questions and share stories. The calls are led by Chany Silber, a Jewish mother in Brooklyn. She didn’t return a phone call from BuzzFeed News, but last month, she briefly spoke to a WNYC reporter who knocked on her door. “Listen, nobody died. Nobody’s dying,” she told WNYC, who then pressed her on the deaths routinely caused by measles before vaccination was widespread. “The CDC says a lot of fake things,” she said. Public health officials have stressed that anti-vax groups don't represent the views of most their residents, including the Orthodox community.